Meredith: I probably can't stay very long. Thatcher: There's so much to say, I don't know what to say. Permalink: There's so much to say, I don't know what to say. Jackson: My first sur -- how did you watch? Catherine: Child, please. I am Catherine Fox. Do you think there is a world where I wouldn't sneak into the gallery of my baby's first surgery? Oh, you were a sight to see. I bet Harriet does the same thing one day. Jackson: Well I'll be sneaking up in the gallery with you someday. You went and got a whole new life, halfway around the world this time, but you didn't give a damn about the people you left behind. Tom: Catherine Fox is an icon, a magician and a giant among men, and not just for the reason you think. She's saved more penises in her OR than any surgeon on the planet, and all I can imagine is the dozens of men without functioning penises doomed to live out their sexless lives if I botch this surgery. Amelia: That's what you're worried about? Men and their junk? Tom: That and if I lose her ... I've lost enough. Amelia: Then let's keep her alive. Tom: Let's keep her alive. Permalink: That and if I lose her ... I've lost enough. Catherine: I will see you when I wake up. Jackson, where's Jackson? Jackson [plays music]: One for the road?! Permalink: I will see you when I wake up. Jackson, where's Jackson? Thatcher: Because I moved away? Meredith: Because you ran away because you have never fought for anything or anyone you love in your life. I came home, Meredith, for you. 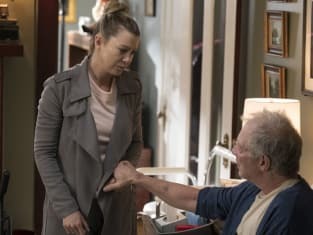 Permalink: I came home, Meredith, for you. Permalink: Shut down the gallery. Mom's always been larger than life you know? Laughs harder? Yells louder. She's always the love of the party.